Notes: My inspiration for this dress was the cherry blossom tree. I love the fluffy white blooms that gradually turn more pink before eventually cascading down and covering the ground. At our previous house, we had Yoshino trees that would herald the arrival of spring, and it always made me smile to look at them. 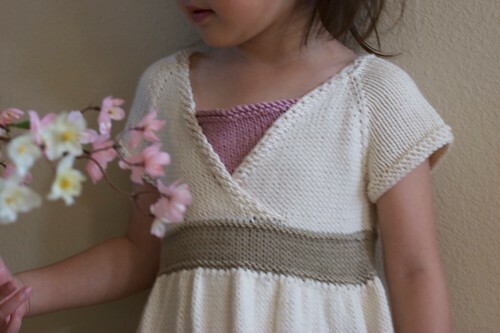 I used the Oriental Lily pattern to give me some guidelines for knitting the surplice top. 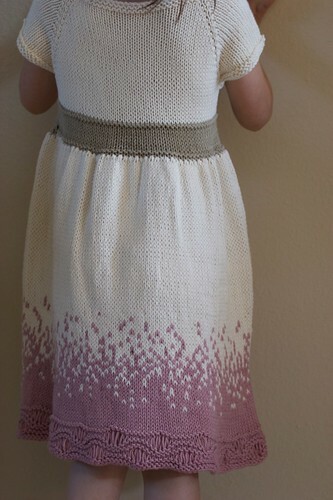 I continued making increases until the top fit my daughter, who is a petite 4-year-old (I started this before the designer updated the pattern to include larger sizes). The sash was done by knitting 1 round, purling 1 round, knitting 6 rounds, and finally purling 1 round. After switching colors and knitting 1 round for the skirt, I doubled the stitch count by knitting into the front and back of each stitch. The skirt is knit straight after that. 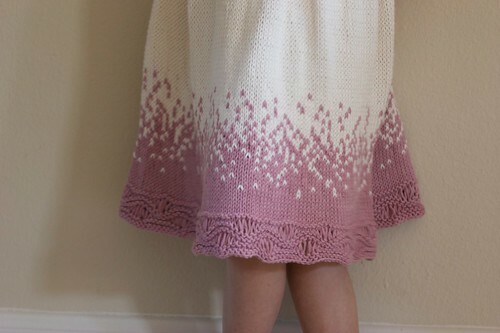 The color transition at the bottom of the skirt was done with the help of a random number generator (I discuss this further on the main blog). The bottom of the skirt has a modified seafoam stitch. 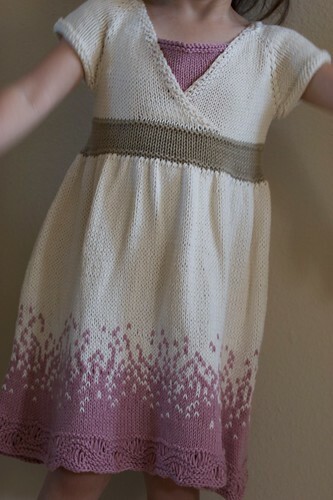 The sleeves are obviously short and have a garter-stitch hem. I knit a small triangle to sew behind the surplice bodice, both for modesty and to bring the pink color to the top. out of this world. You thought up some amazing mods. congrats. I would love to diplicate this . you should write a pattern and sell this. It is very different than the original idea for it.